Pathways Pa., which offers services and advocacy for women, children and families, will honor its 2011 Trailblazers - including the Delaware County Daily Times - at a gala dinner in November. The Department of Labor is currently considering creating a new compensation data tool that would make it easier to enforce laws that prohibit pay discrimination. Since 2006, the federal government has had NO tool to effectively monitor wage discrimination based on race, national origin and gender by private employers. This means that our tax dollars could possibly be going to federal contractors who are not paying women fairly. It's time to take a stand. Raise your voice: tell the Department of Labor to move us forward and collect wage data. Note: The comments you submit will be processed by the appropriate agency and then made publicly available on Regulations.gov. While I have been trying to keep up with the news on the latest poverty data, today was my first opportunity to work with it. As I began to look at the changes from 2009 to 2010, I came across a surprising discovery: the highest percentage point increase in poverty in the five county area was not in Philadelphia - it was in Bucks County. The IRS publishes a list of organizations that have had their federal tax-exempt status automatically revoked for failing to file an annual information return or notice with the IRS for three consecutive years. The Automatic Revocation of Exemption List (Auto-Revocation List) provides the organization's name, employer identification number (EIN), organization (subsection) code, last known address, effective date of revocation, and the date the organization's name was posted on IRS.gov. The list will be updated monthly as organizations lose their tax-exempt status for not filing. Additional updates will be made as necessary. The date at the bottom of this web page indicates when this page was last updated.You can download the list of Pennsylvania organizations in Excel or Adobe Acrobat. When: October 25th, 7:30 a.m. to 5 p.m. 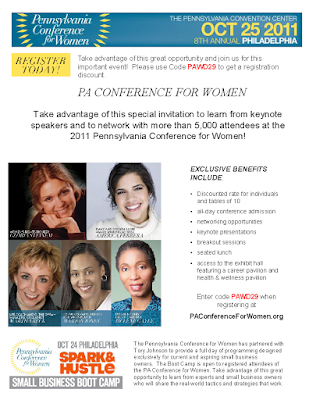 The 8th Annual Pennsylvania Conference for Women will be held on October 25th – and includes a stellar line-up of speakers including iconic activist Gloria Steinem, CARE USA president and CEO Dr. Helene Gayle and actress America Ferrera – among many, many others. The event brings together women from across the region for networking, skill building and community building, and includes such programming topics as personal development, social networking, career advancement and entrepreneurship. In addition, a small business boot camp will be held on October 24th. For more information or to register, please visit their site. "Hunger experts, meeting in Phila., stew over 'food deserts'"
Others speakers included Lyn Kugel, a senior director of PathwaysPA, a social service agency in Holmes, Delaware County. Citing the high costs of housing, food, and child care in the area, Kugel said a single parent with one school-age child and one preschool child would need to make $54,705 annually to live without using public assistance. "That's startling," Kugel said, saying few single parents in the area make that much money.To read the full article, please visit http://www.philly.com/philly/news/pennsylvania/130398213.html. The Senate returned to session last week and the House returns this week. Marcellus Shale development continues to dominate the agenda, with Governor Tom Corbett announcing his support of a local impact fee and the Department of Environmental Protection (DEP) announcing a major reorganization. “These organizational changes will enhance the department’s ability to protect Pennsylvania air, water and land, and also will result in a consistent and predictable regulatory system,” Department Secretary Krancer stated. “This is an installment of delivering what Governor Corbett promised during the campaign; and I, along with the governor, am committed to protecting the environment and public health for the future of all Pennsylvanians by strictly and vigorously enforcing our environmental laws.” DEP specifically elevated the status of the Bureau of Oil and Gas Management to address Marcellus Shale natural gas extraction. For more information, please click here. Many of us think of the winter holidays as the season of giving to our families, friends and to those in need. But did you realize that every season can be a season of giving? For those of us who take part in workplace giving programs, each fall brings a new opportunity to support nonprofit organizations throughout the next year. This year, when you are filling out your donation forms, please think about PathWays PA and what your donation can do for the families we serve. With as little as $5 per pay period, PathWays PA can use your donation to purchase a crib for a new mother or a move-in package for a family’s first apartment. With your donation of $10 per pay period, PathWays PA can fund the purchase of a toddler bed, a safe car seat, and some beginning kitchen equipment for parents working to support themselves and their families. Gatherings like the Pennsylvania Conference for Women play a key role in fostering the connections that help women thrive in their personal and professional lives. In addition to inspirational keynote presentations, the conference offers informational workshops with specialized tracks, a small business boot camp, a Health and Wellness Pavilion, a LinkedIn Connection Lounge, more than 20 informational workshops and networking with peers and local leaders. The President's just-announced plan, Living Within Our Means and Investing in the Future, is a comprehensive approach to solving the nation's short- and long-term problems. It includes the American Jobs Act, legislation investing $447 billion to fund teachers and public safety workers, modernize schools and other infrastructure, target job creation in low-income communities, provide extra help to long-term unemployed, youth, and other especially vulnerable groups, and protect the jobless with an extension of federal Unemployment Insurance. The Homeowners Emergency Mortgage Assistance program (HEMAP) was suspended July 1 due to state budget cuts.HEMAP, which has saved the homes of over 45,000 Pennsylvania families since 1984, offers low interest loans to allow homeowners to stay in their homes during temporary economic problems like unemployment, illness, etc.With the unemployment and foreclosure crisis continuing into its 4th year, with no end in sight, PA needs mortgage help for our citizens. 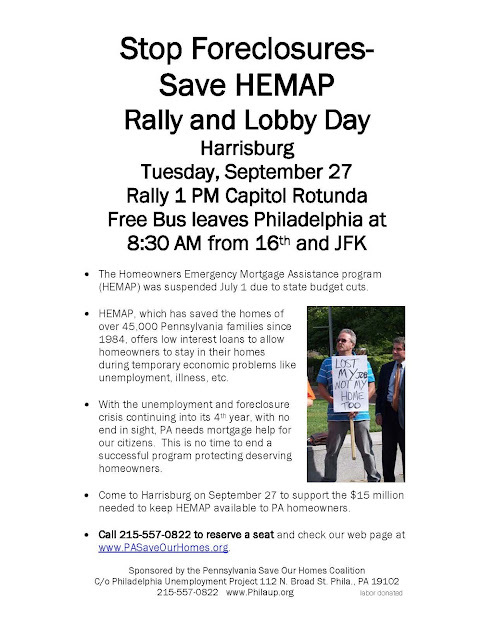 This is no time to end a successful program protecting deserving homeowners.Come to Harrisburg on September 27 to support the $15 million needed to keep HEMAP available to PA homeowners.Call 215-557-0822 to reserve a seat and check our web page at www.PASaveOurHomes.org. It's Adult Education and Family Literacy Week - Show Your Legislators the Importance of Education! This Adult Education and Family Literacy Week, please take a moment to tell your legislators about the need for job training and educational opportunities for adults. While nearly 2/3rds of jobs will require some form of postsecondary education by 2018, 90 million adults in the United States will not be ready to meet those needs. We need job-training opportunities as part of any job plan to ensure that all workers and employers can take advantage of the current job market and help prepare America for the future. Please take a moment to tell your legislators how important job-training is. Each year when the Census Bureau releases new numbers on poverty in the United States, the day of the release is called (rather unimaginatively) "Poverty Day." Today's Poverty Day shows some sobering data- especially when we consider that these are families living below the Federal Poverty Level, which is far lower than what families need to make ends meet. "DHS honors students who beat the odds"
Students at the Achieving Independence Center, where PathWays PA provides services, were honored for overcoming the tremendous obstacles that occur when aging out of the foster care system. Without a strong support system, young men and women, leaving foster care are more likely to experience unemployment, dependency on public assistance and homelessness. If you would like to learn more or mentor youth aging out, please call PathWays PA at 215-574-9194. Have you seen the preview for Contagion - the new blockbuster film about a global flu pandemic? What's most frightening about this star-studded film is that flu epidemics are real, and they can spread quickly - especially in the Philadelphia, where over 200,000 hard hard-working people without paid sick days are forced to choose between their financial security and their health when they get sick. During the recent H1N1 outbreak, seven million of the people caught the flu from their co-workers. Less serious flus and colds can also disrupt our lives. Through September 15, USDA will be accepting comments on its interim rule, National School Lunch Program: School Food Service Account Revenue Amendments Related to the Healthy Hunger-Free Kids Act of 2010. Follow this link to find out how to submit comments. Tell USDA how it can lessen the possible negative impact of increased school lunch prices on vulnerable families and the viability of the program itself. And tell USDA that you support the requirement for schools to generate as much revenue as they spend on nonprogram foods (commonly called “competitive foods”). Click here to find FRAC model comments (MS Word document). The proposed regulations are open to public comment through September 15, 2011. Sociologists and advocates for the poor use alternative formulas to determine the minimum level of income required for a family to sustain itself. The Self-Sufficiency Standard, for example, considers regional variation in living expenses and accounts for food, housing, child care, health care, transportation, taxes and other costs. Last year, the Standard estimated the cost of living in York County for a single parent with a preschooler and school-age child was $42,114, which requires an hourly wage near $21.60. In comparison, the federal poverty line for a family of three is $18,530, which comes out to $9.50 an hour earned by a single parent working 40 hours a week. One in five households in Pennsylvania lacked self-sufficiency wages last year, according to an analysis by the Center for Women's Welfare at the University of Washington. In 85 percent of these households, at least one adult was working. We know that across the country, Americans are looking for jobs so that they can support their families and acheive their dreams. What is less known is that across the country, employers are searching for workers - but too often they come up empty because they can't find workers with the skills and education needed to perform in the workplace. We need job-training opportunities as part of any job plan to ensure that all workers and employers can take advantage of the current job market and help prepare America for the future. Please take a moment to tell your legislators how important job-training is. To write your legislator, click here. Support Programs That Keep More Money in Your Pocket!